Of course you want to bundle your baby when it’s time to go outside into the cold, but if you’re headed for the car, skip the coat and opt for a car seat bunting. The average coat adds several inches of slack to the car seat’s harness straps, meaning baby isn’t properly secured in the seat and could be ejected in the event of an accident. Even popular bunting bags, which have slots for straps to anchor the bunting to the car seat, can be a hazard. The solution. Dress baby in fleece: it’s a dense and warm material, yet not bulky. Then, secure baby in the seat with no coat and tuck a thin blanket (think fleece!) around baby and over the car seat harness to keep him or her toasty until the car warms up. As adults, we wrap ourselves in cozy blankets when winter arrives and it’s time to sleep, but the same rules don’t apply when it comes to infants. During the first year, there should be nothing in the crib with your child. There are serious hazards associated with keeping anything in the crib, especially blankets and crib bumpers. So how can you keep your baby warm? Layer clothing and choose pajamas with feet. Better yet, look for “wearable blankets” and “sleep sacks that won’t get tangled and keep baby cozy. The cold air can cause anyone’s skin to dry out and infants are particularly susceptible. The most common areas for babies to experience dry and chapped skin are their cheeks, chin and wrists… areas that are most likely to be exposed to the elements. This problem will leave you with a very irritable baby, as the feeling of dry and chapped skin can be extremely uncomfortable. One good way to protect your baby’s skin is to ensure it is as covered as possible when taking a trip outside, and try to keep the length of time you spend outdoors to a minimum. In addition, keeping your baby’s skin moisturized is a must. Create a barrier for their skin using a layer of thick moisturizer: this will hinder a rash from occurring as well as treat any rash that may have already formed on the affected area. 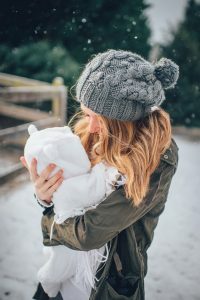 Keep these essential pieces of parenting advice in mind, and you and your baby will make it through to spring in no time!